Eric Hobsbawm, who passed away in 2012, was one of the most brilliant and original historians of our age. Through his work, he observed the great twentieth-century confrontation between bourgeois fin de siecle culture and myriad new movements and ideologies, from communism and extreme nationalism to Dadaism to the emergence of information technology. 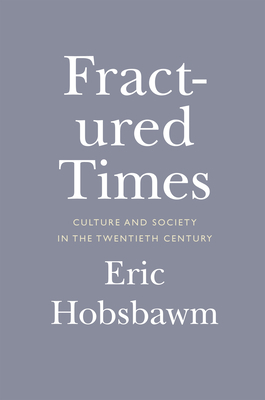 In Fractured Times, Hobsbawm, with characteristic verve, unpacks a century of cultural fragmentation. Hobsbawm examines the conditions that both created the flowering of the belle epoque and held the seeds of its disintegration: paternalistic capitalism, globalization, and the arrival of a mass consumer society. Passionate but never sentimental, he ranges freely across subjects as diverse as classical music, the fine arts, rock music, and sculpture. He records the passing of the golden age of the "free intellectual" and explores the lives of forgotten greats; analyzes the relationship between art and totalitarianism; and dissects phenomena as diverse as surrealism, art nouveau, the emancipation of women, and the myth of the American cowboy. Written with consummate imagination and skill, Fractured Times is the last book from one of our greatest modern-day thinkers. Eric Hobsbawm was born in Alexandria in 1917 and educated in Austria, Germany, and England. He taught at Birkbeck College, University of London, and then at the New School for Social Research in New York. In addition to The Age of Revolution, The Age of Capital, The Age of Empire, and The Age of Extremes, his books include Bandits; Revolutionaries; Uncommon People; and his memoir, Interesting Times. Eric Hobsbawm died in 2012.